So it’s the end of our project and I must say, I’ve had a really great time becoming more confident working with audio. The actual recording process was much more organised in our second shoot for A New Place I Call Home. All of my skill researching has been online and it’s been the case of sharpening my teeth using the simplicity that is Garageband and Audacity before moving back to other programs like Cubase which is a more complex program. I’ve since been getting reacquainted working with sound in my new job now…I haven’t dealt with audio like this since my last degree…which was last decade! And mastering was just a thing music producers did as far as I was concerned when I began finally recording my own music tracks. So I’ve learned to move past my own limitations here which is fantastic. Working with audio equipment other than my trusty audio interface and mics and home is nerve wrecking! Dealing with channels made me nervous with zoom mics. Boom mics were far easier to contend with during this project which I believe has to do with a mixture of lack of experience, faulty gear, and fluctuating confidence levels. I think if I actively explore sound in my own time and space I will get better at using the equipment efficiently. In terms of animation, I was so pleased to be able to create simple animations on After Effects. The last program I learned animation on was Flash and again…this happened last decade! It meant a lot to gain confidence and I hope to further my skills in this area in my own personal projects. I have loved working on this project and hope our team does collectively agree to pitch the show as it’s a wonderful concept with so much potential! I’m not going to lie. My interest in media started in the analog days, so my newly coined position description of ‘content creator’ actually derives from my days chasing the paid title of ‘journalist’. The problem here is that ‘content creator’ can mean many different things to different organisations and businesses. As far as I’m concerned, I’m a story-teller. I use different media skills to tell stories. So, I’m going to cover one practitioner who represents my core skill as a person who loves presenting and showcasing great stories. Seeing as I’ve enjoyed co-directing videos and now find myself meeting different personalities to film interviews on, this quote means a lot. The last thing we want is someone’s nerves to shadow the story and creating rapport is so important when producing videos! That is why I am currently meeting subjects before filming stories for a web series I am working on at work because the outcome promises to be a lot better. We were really pleased with the feedback given for our web series A New Place I Call Home. I think the editing tips were fantastic. Though my role in this project has been around sound production and music, I often longed to edit as it’s my natural inclination to pin stories together. After my initial pitch-in with the process for our EPOC last semester, I solely concentrated on my area except for this idea of starting the show at the door of the person Vivi would interview. It reminded me of a lot of home-maker shows where the TV host would come to ‘makeover’ someone’s home. 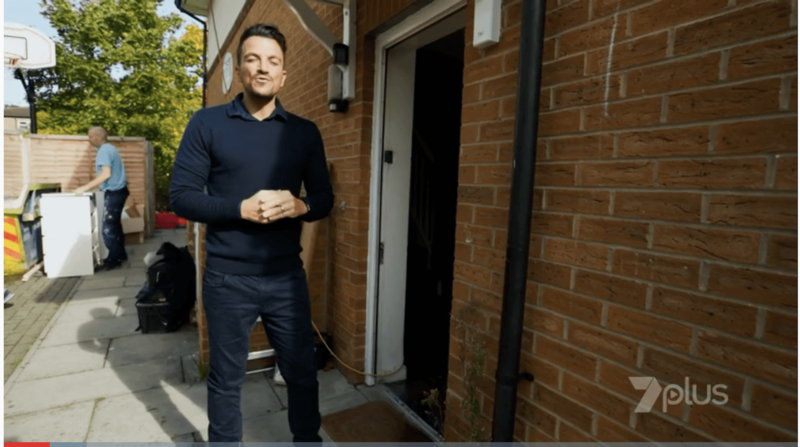 I can absolutely understand where the feedback came from about the prolonged greeting of Vivi’s friend Jenny coming to the door with the intercom (one of the two webisode rough cuts showcased). It was a fun idea but the suspense was not needed in this element of the show as it wasn’t really a surprise. It was the dish that was supposed to be the surprise element if anything! Keeping the scene simple was a great idea. I also appreciated the mention of the sound element. 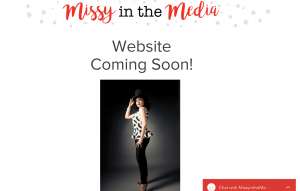 I am really enjoying ‘branching out’ by using my music skills for media purposes! I also look forward to exploring more animation with the intro piece I want to contribute to the project for our team. I’ve been exploring ways I could showcase my work and services from around late last year! In all the time I’ve been developing my CV, it seems I’ve been confronted by the idea of showcasing my work. It’s come to my attention that the more I fail to see enough value in the work I create by avoiding the opportunity to showcase them properly, the less likely I would gain regular work. It was at this confronting realisation that I decided to really make concise decision making around my purpose as a media maker, the skills I’m offering and the way I present myself. When thinking about how I could showcase my work, I couldn’t help but want to draw upon the classic, simple sophistication of illustrator Megan Hess’s website. Why? Well it has a delightful sense of self-branding which is what I was going for. Over time, the one all-encompassing ‘compliment’ that remains consistent is usually about my ‘energy’. Given this fact, I thought it might be a good idea to capatilise on my enthusiastic, ‘Missy’ persona when showcasing my work. So it’s not ‘just’ about the work I do, but ultimately about the person they will be working with. The service, the love that goes into work, building good business relationships, etc. So back to Megan Hess. I have this idea of animating graphics that I’d love to use and look into creating a showreel of some of the videos I’ve worked on, really (hopefully) showcasing my love of storytelling through effective production and editing. Also, as someone who calls herself a Content Creator, I thought I’d look to another Content Creator’s website. I want to advertise where I’ve worked, feature recommendations and have even had a photoshoot to assist with the vibe of my brand. Try to go to at least one event every quarter that is related to the areas of media that I am interested in. Note: I have already joined Meetups but have not had the time to go to any of the meetups I’ve wanted to do due to clashes. Perhaps I can begin doing this during the summer holidays when it is more feasible. I am about to embark on a new era in my media career as a communications officer at Melbourne Catholic Archdiocese. So far I have done projects as a Comms Writer, a Video Co-Producer and Director, a Graphic Artist, Copywriter and Freelance Journalist. This role will amalgamate my interest in a world that I grew up in. I will endeavour to really create some notable pieces in my time here while studying my Master of Media. Keep up my grades and study interest while working! Prepare my missyinthemedia website: each page needs work and images need to be uploaded. Look after my health and make sure that I am in fine working order seeing as I’ll be very busy! Work on at least one podcast!!! Keep track of all these goals so I don’t look back in a year’s time and wonder what has happened. Try and network with people in the industry that I admire. This is huge. I always feel a bit strange approaching people whose work I love. I don’t want to be seen as creepy or insincere or too gushy. I need to really plan out at least a question or two to ask to create value out of the situation and create an open communication line.. I want to expand Cultureline and work on producing it, however with my work and study commitments I will have to put it on hold and perhaps keep working on developing the idea and gauging interest in terms of who I could collaborate with. My audience and my client are one in the same in some ways. If we are looking at my work as a media content creator, my clients are organisations in the arts, entertainment, cultural and tourism sectors of the community. Those who would like the work I am producing would be their audience. So, a wide age group between 16 and 90 who are actively taking interest in their community by visiting art shows and galleries, going to see shows and events and love supporting lots of different groups within the community. These are people who love watching documentaries on history and culture. They INVEST time and money in sorts of things and care about preserving this part of our cosmopolitan style of living. They may be interested in supporting local and donating their money towards these kinds of organisations. They love getting to know their own area, their own city. Their persona might be the typical foodie, the hobby historian, the fashionista or the art collector. The philanthropist and the volunteer. Basically people who share my love and interest in all that makes life lovely or society better. People who want to begin their journey opening their mind to the world around them. People who love their senses dazzled. Instagram is for the consumer side of my audience who love experiences, opening their mind, learning and contributing to the world in a positive way. People who are inspired by interesting storytelling, images and memes. LinkedIn is for my client audience who are potential people in my network that I could work with on projects. I like to use my LinkedIn by incorporating posts about my work and studies to both promote the work that I do and the energy and thought process behind my creativity and inspiration. 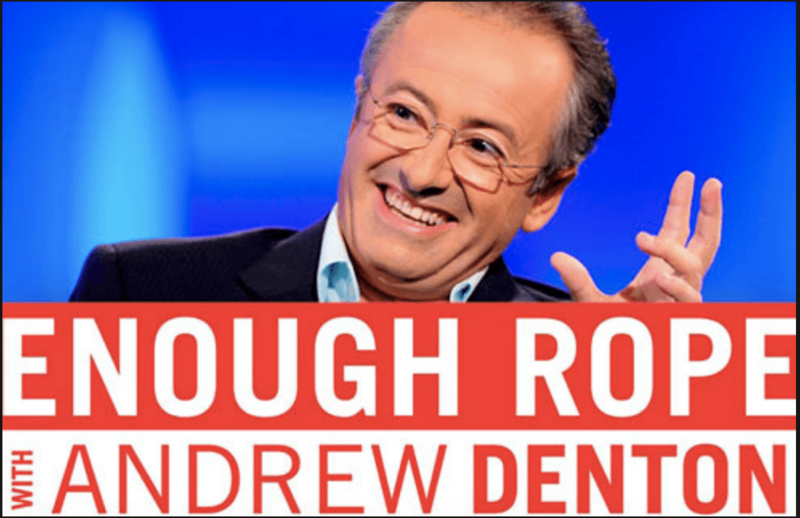 It’s basically to encourage people to want to work with me! There are a few elements of sound that really pique my curiosity when it comes to production. Two that delight me the most are foley and music production. In this post, I’m going to talk about music production as I’ve been delving into creating a little soundtrack for our project A New Place I Call Home. 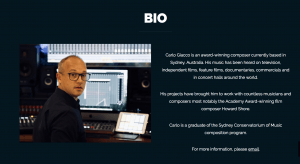 As my study, I’ve chosen composer Carlo Giacco who is more a music composer than a media practitioner but to be fair, his catalogue’s focus contains soundtracks he has created for TV Shows and motion films. You can check out his work at www.carlogiacco.com. Upon closely studying his style for Food Safari, (check out an example episode here,) You will hear the layers in what makes up a really interesting ‘textured’ tapestry of instrumental sounds and emotion. Similarly, if you play any of the featured soundtracks on his website you will notice the emotion conveyed in different ways. For Food Safari there is a fast momentum that sounds exciting and builds anticipation, adventure and drama and echoes the spirit of far-off lands. As you continue to watch the episode, the music changes to a track that is inspired by the culture that the episode is about which is fused with a smooth contemporary feel. All kinds of instrumental sounds are used to create this exciting sound. 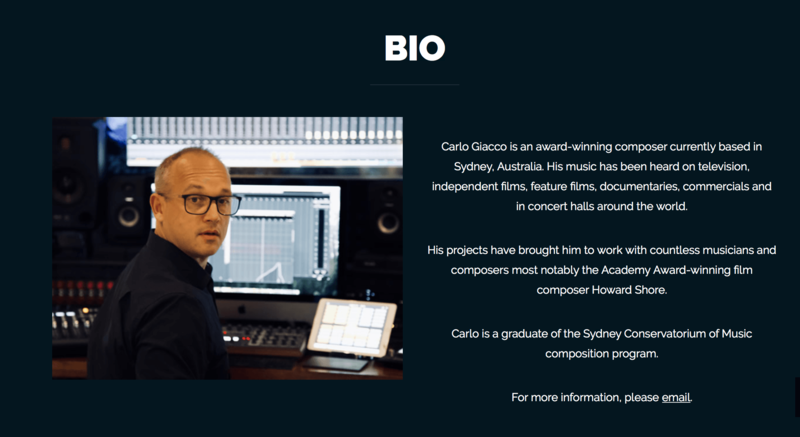 With Carlo Giacco’s background in music composition, it is no surprise that his tracks are cleverly and strategically composed. While I’ve studied a bit about music’s foundation and have a natural understanding of how it works, on a personal note my husband has a similar education background to Carlo and played in youth orchestras, studied both orchestral and contemporary music and can write scores. While music can be very instinctive for many creatives, make no mistake when it comes to composing music for TV shows and movies: there is a strategy and theme involved and a certain level of innovation required to create rich and moving tracks that can captivate the viewer and help create the momentum and ambiance of the moving image. and a content maker named Kayla Hollatz who has a really nicely branded, engaging website that also makes use of the concept of self-branding to engage B2C: http://kaylahollatz.com. Melissa Parkinson has a background in professional writing and editing as well as multi-media and media studies. Melissa is a Melbourne-based Content Creator who is passionate about storytelling. She specialises in various genres of writing, editing, video and podcast production as well as graphic art work. She has worked on projects for Melbourne Water, Culture Trip and Multicultural Arts Victoria. I have worked across different roles which include article and communications writing, logo design, video production, directing and digital & social media content planning. I absolutely love helping organisations, businesses and projects that highlight the beautiful culture, entertainment, arts and tourism that Melbourne has to offer. I’ve also begun conceptualising my very own project called Cultureline which consists of a podcast series on Anglo-Indians, a digital tour of India and an interactive, multi-platformed documentary experience of Anglo-Indian history. I’m currently working on a food and culture web-series as part of my Master of Media portfolio called a New Place I Call Home. In this project, I veer a little away from being a producer and take on sound design: creating, mastering and sourcing music for the show, sound recording, and post-production work. I work remotely and love the buzz of meeting individuals and teams to help bring stories to life. So don’t hesitate to get in touch. Let me bring your story to life! EDIT: Curious to see how it shapes up? Based on some helpful feedback in class, here’s my next draft. Melissa Parkinson is a Melbourne-based Content Creator who specialises in the various genre of writing, editing, video and podcast production, and graphic art work. Melissa loves helping organisations, businesses and projects that highlight the beautiful culture, entertainment, arts and tourism that Melbourne has to offer. Some of the organisations she have been involved with over the past few years include Melbourne Water, Culture Trip and Multicultural Arts Victoria. 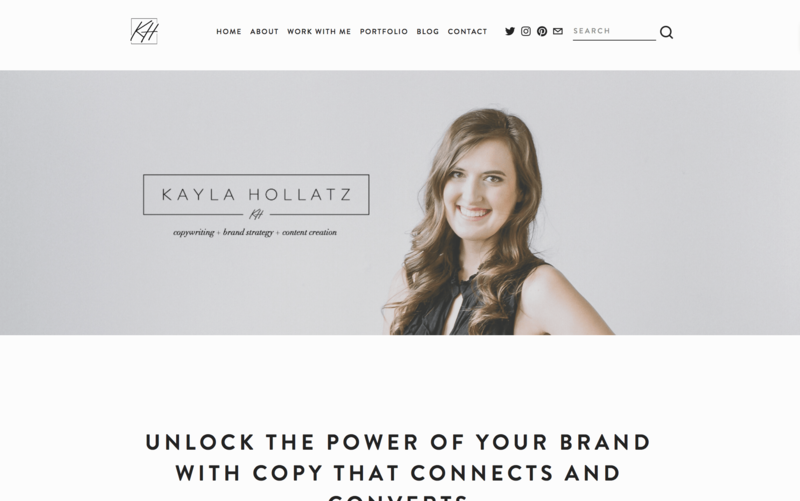 She has worked across different roles which include article and communications writing, logo design, video production, directing and digital & social media content planning. She’s developing her very own project called Cultureline which consists of a podcast series on Anglo-Indians, a digital tour of India and an interactive, multi-platformed documentary experience of Anglo-Indian history. She is currently working on a food and culture web-series as part of my called a New Place I Call Home. In this project, she takes on sound design & writing: creating, mastering and sourcing music for the show, sound recording, and post-production work as well as website content writing. While preparing for our pitch, we really strived to a) make sure we covered all the ‘need-to-know’ points b) balance out the dialogue among our team and c) try and inject a bit of engagement or strike some interest in our style of presenting. I think the feedback provided was really helpful. From encouraging us to further explore similar food/culture shows to encouraging our lovely host Vivi to mentioning the sound approach which I covered really helped us think about what we should do next to stay present in the production of each webisode- to really think about how we draw out the very best in what this show could be. I am picturing us exploring Vivi’s character as a host to bring a bit of that into the show through our storyboarding to introduce the show, create any voiceovers if need be and write great outros that segway to the next episode in an interesting and engaging manner. I am really keen on expanding my skills working with sound and hope to create something special for this project that helps bring it to life with effective techniques in both the music and diegetic sounds. I plan on doing further research and testing to see how I can come up with feasible ways to improve my approach to sound: from sound levels to mastering! This semester I have the pleasure of applying my love of exploring the concept of culture through a media production called A New Place I Call Home, which is: a web series that strives to start conversations with multicultural Melbourne. By visiting immigrants from various cultural backgrounds, our host Vivi helps our guests re-create their favorite traditional meal as they talk about culture, childhood memories and their new home in Melbourne. I think this really captures why the project is relevant. There is a need to create media targetting those who have moved to Australia. Creating a platform in which they can share their stories can create a sense of belonging and a fantastic opportunity to reach out to not only those in similar shoes but Australian born folks alike. My role in this project will be a bit different from other collaborative projects I have taken part in during my studies. I am usually a producer and creator, but this time I will be concentrating on sound… and combining it with the familiar territory of writing! So I’ll be recording sound for all episodes, working on sound levels, and any writing required for the project will be worked on by yours truly, as well. I’ve also created the theme music behind the series which I’m keen to explore mastering. I’m excited and slightly anxious about exploring sound in a web series project. I feel more comfortable producing podcasts and recording music, however, my zoom microphone experience leaves a lot to be desired. I think it’s a great opportunity, however, to step out of my comfort zone. It means I can actually grow and eventually feel a sense of confidence with sound on a broader scale. Plus it makes sense as I’ve always had a natural ear for music, foley, voiceovers etc. I may not be great at this role, to begin with, but I’ve felt that way about many of my acquired skills! I am also excited as this adds to my portfolio which works largely with culture and entertainment.